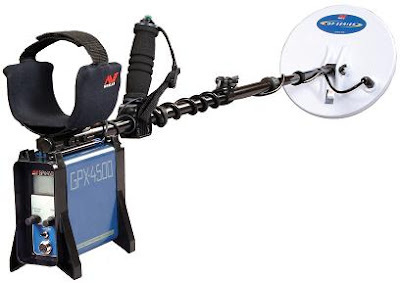 Minelab's bi-level pulse induction (PI) "GPX 4500 " metal detector is considered by many gold nugget and treasure hunters as the best gold-detecting machine on the market today. At a whopping retail price range of $4,500-$5,000, it damn well better be. Stop and think about this for a moment. How many of us (whether novice miners/treasure hunters or old pros) can readily shell out 5 grand for a gold machine without batting an eye? The Minelab "GPX 4500" costs a chunk of change my friends....there's no getting around that fact. And therein lies the rub. "Enhanced" and "Sharp" Timing Settings: These 2 settings have been added to the "GPX 4500" to create a total of 6 timing settings that help optimize the machine's performance (improved detection depth, signal response, and pinpointing ability) depending on the type of ground being worked. Increased Audio Gain: The design of "GPX 4500's" amplifier and the use of high-quality low noise components make the machine's signal response clear and crisp, without the typical background hum found in other detectors. "Custom Mode" that you can set up based on your own needs or preferences. "General Mode" which is for basic operating conditions. "Deep Mode" for those hard-to-reach targets buried at depth. "Hi-Mineral Mode" which is typically employed in "hot" or highly mineralized locations. "Hi-Trash Mode" which is pretty much self-explanatory. The other two operating modes, "Patch Mode" and "Test A Mode" I tend to place in the "bells and whistle" category and I'm not sure of their overall value in actual operation. Perhaps one of you Minelab enthusiasts out there can clarify this for me. Negative Ground Balancing: This aspect of the "GPX 4500" can really come in handy on those occasions where you are nugget or treasure hunting in "neutral" or low-mineralization soil environments. For you cache and artifact hunters out there, this means increased detection depth in loamy or sandy soils when you bypass the "GPX 4500's" ground balancing function by setting it in the "Off" position. Minelab has been producing excellent detectors. It’s nice to think of evaluating some of their products to see what they can do and how they may help you in your relic hunting and coin shooting heroics. It is true that many MD user has been disappointed while using detectors and that is sad. The search coil of this Minelab GO-FIND 40 Metal ﻿D﻿etector is highly sensitive and can be immersed in water to find treasures. That already informs you that you can use it on both wet soil and the dry sand of the beach. You can make your sweeps endlessly to find much treasure than you thought.